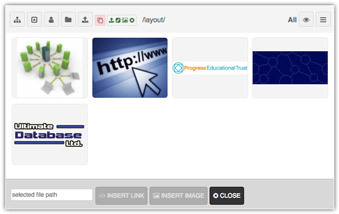 The file manager enables user access to files and provides various functionality. The user’s level determines which folders they can browse and what permissions they have in each folder. When editing a page, use the "File Browser" button to open the file manager. The contents of the bottom bar change slightly depending on the use of the file manager. If a single file is selected, the path to that file (from the domain) is displayed. There will also be buttons allowing functionality, such as inserting an image into the page editor and closing the file manager. Hover over a file or folder to view its edit options (these will vary depending on file type and user permissions). User folders are named “user” followed by the user ID, for example “user1375”. Within each user folder is years named with 4 digits “2017” then months named with two digits “07”. Folders can be added as needed (providing the user has suitable permissions) to build on the basic structure. By default, images are scaled down if above 1024x1024px. Scaling can be disabled by adding a folder named "hi-res". Any image uploaded into a "hi-res" folder (or any folder that is a descendent of a "hi-res" folder) will not be scaled down. To control users access to files, place them under a folder named "secure". All files in this folder, and its sub folders, will be checked before being served to the user. The system will check the user's permission on the object and return the file if allowed. 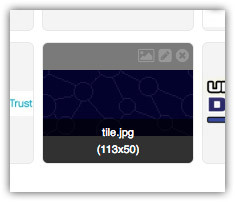 The entry in the URL field should not include the domain, just the file path including the initial forward slash, for example "/res/org99/secure/secret.jpg". * Users with a level below Restricted only have access to the current month folder, they cannot navigate into other months or years.